Warrenpoint Town boss Barry Gray aims to build on the weekend win over Coleraine by beating Portadown and boosting hopes of avoiding relegation. Warrenpoint are still six points adrift at the bottom ahead of Tuesday night's match at Milltown. "This is a massive opportunity to put six points on the board in a short space of time," said Gray. "The confidence from Saturday's win puts us in good stead for the Ports game but we know it will be tough." Stephen Murray scored twice in the 3-0 victory over the Bannsiders to secure just a second league win of the season for Warrenpoint. Gray added: "There will be no celebrations for this win. Some of the stats are scary - it was our first home win of the season and our first clean sheet and that's nothing to be celebrating. "However, hopefully it is the the first step for things to come and we have a fairly decent record against Portadown." The Ports will be without suspended Tim Mouncey and Michael Gault while Monday's signing Philip Lowry is not eligible to play as international clearance has not yet come through. 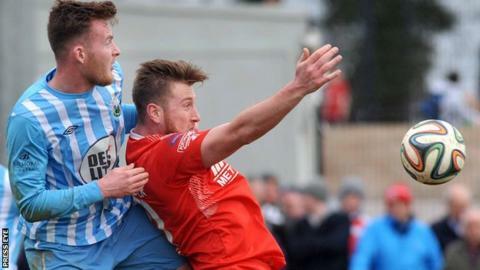 It is one of four re-arranged matches on Tuesday evening with Ballymena United hosting Carrick Rangers in another league game. There are two Irish Cup fifth round encounters with Annagh United taking on Knockbreda and Glentoran facing Championship leaders Ards at the Oval. "We need to get out of the traps quickly - it's a banana skin against lower opposition," said Glens boss Alan Kernaghan. "I've watched Ards and they work hard and we know we will have to be at our best to progress."